Indicate by check mark whether the registrant is a large accelerated filer, an accelerated filer, a non-accelerated filer, a smaller reporting company or, an emerging growth company. See the definitions of “large accelerated filer,” “accelerated filer,” “smaller reporting company,” and “emerging growth company” in Rule 12b-2 of the Exchange Act. As of October 31, 2018, there were 153,304 Gold Deposit Receipts outstanding. · The performance of the gold market. The forward-looking statements contained in this report are based on the Trust’s current expectations and beliefs concerning future developments and their potential effects on the Trust. There can be no assurance that future developments affecting the Trust will be those that it has anticipated. These forward-looking statements involve a number of risks, uncertainties (some of which are beyond the Trust’s control) or other assumptions that may cause actual results or performance to be materially different from those expressed or implied by these forward-looking statements. These risks and uncertainties include those factors described under the heading “Risk Factors” in this Form 10-K. Should one or more of these risks or uncertainties materialize, or should any of the Trust’s assumptions prove incorrect, actual results may vary in material respects from those projected in these forward-looking statements. The Trust undertakes no obligation to update or revise any forward-looking statements, whether as a result of new information, future events or otherwise, except as may be required under applicable securities laws. The Trust issues Depositary Receipts (“Gold Deposit Receipts”) representing an undivided beneficial ownership in a fixed quantity of unencumbered, allocated, physical gold bullion (“Gold Bullion”). The Gold Bullion is held for the benefit of holders of Gold Deposit Receipts in an account operated by Bank of Montreal at the Royal Canadian Mint (the “Mint”). The Bank of New York Mellon serves as the trustee of the Trust. The Gold Deposit Receipts are separate from the Gold Bullion. General. This discussion highlights information about the Trust. The Vaulted Gold Bullion Trust. The Trust was initially formed on December 10, 2013. The Trust is governed by the Second Amended and Restated Depositary Trust Agreement, dated May 11, 2017 (the “Depositary Trust Agreement”), by and among The Bank of New York Mellon, as “Trustee,” BNY Trust of Delaware, as “Delaware Trustee,” Bank of Montreal, as “Initial Depositor,” and BMO Capital Markets Corp., as “Underwriter.” The Trust is not a registered investment company under the Investment Company Act of 1940, as amended (the “1940 Act”). The Trust is not a commodity pool for purposes of the Commodity Exchange Act (the “CEA”), and the Initial Depositor is not subject to regulation by the Commodity Futures Trading Commission (the “CFTC”) as a commodity pool operator, or a commodity trading advisor. The Trust is not managed like a corporation or an active investment vehicle. It does not have any officers, directors, or employees and is administered by the Trustee pursuant to the Depositary Trust Agreement. The expenses of the Trust are borne by the Initial Depositor. The Trust issues Gold Deposit Receipts representing an undivided beneficial ownership in a fixed quantity of Gold Bullion. One Gold Deposit Receipt represents the undivided beneficial ownership of one troy ounce of Gold Bullion. The Trustee performs only administrative and ministerial acts. The property of the Trust consists of the Gold Bullion and all monies or other property, if any, received by the Trustee. The Initial Depositor sells Gold Bullion to the Trust. The Gold Bullion is held for the benefit of holders of Gold Deposit Receipts in an account operated by the Initial Depositor at the Mint. Initial Depositor. The initial depositor of the Trust is Bank of Montreal (“Bank of Montreal” or the “Bank”). The Bank commenced business in Montreal in 1817 and was incorporated in 1821 by an Act of Lower Canada as the first Canadian chartered bank. Since 1871, the Bank has been a chartered bank under the Bank Act, and is named in Schedule I of the Bank Act (Canada) (the “Bank Act”). The Bank Act is the charter of the Bank and governs its operations. The Bank is a registered holding company under the Bank Holding Company Act of 1956 and is certified as a financial holding company under the Gramm-Leach-Bliley Act. The Bank’s head office is located at 129 rue Saint Jacques, Montreal, Quebec, H2Y 1L6, and its executive offices are located at 100 King Street West, 1 First Canadian Place, Toronto, Ontario, M5X 1A1. The Bank’s telephone number is (416) 867-6785. Bank of Montreal brands the organization’s members as BMO Financial Group (“BFG”). BFG is a highly diversified financial services provider based in North America. Bank of Montreal offers a broad range of products and services directly and through Canadian and non-Canadian subsidiaries, offices, and branches. As of October 31, 2018, Bank of Montreal had more than 12 million customers and more than 45,000 full-time equivalent employees. The Bank has over 1,500 bank branches in Canada and the United States and operates internationally in major financial markets and trading areas through its offices in 27 other jurisdictions, including the United States. BMO Financial Corp. (“BFC”) is based in Chicago and wholly-owned by Bank of Montreal. BFC operates primarily through its subsidiary BMO Harris Bank N.A. (“BHB”), which provides banking, financing, investing, and cash management services in select markets in the U.S. Midwest. Bank of Montreal provides a full range of investment dealer services through entities, including BMO Nesbitt Burns Inc., a major fully integrated Canadian investment dealer, and BMO Capital Markets Corp., Bank of Montreal’s wholly-owned registered securities dealer in the United States. Bank of Montreal conducts business through three operating groups: Personal and Commercial Banking (“P&C”), made up of Canadian P&C and U.S. P&C; Wealth Management; and BMO Capital Markets. Canadian P&C operates across Canada, offering a broad range of products and services, including banking, lending and treasury management. Operating predominately in the U.S. Midwest under the BMO Harris brand, U.S. P&C offers personal and commercial clients banking, lending, and treasury management products and services. Wealth Management serves a full range of client segments from mainstream to ultra-high net worth and institutional, with a broad offering of wealth management products and services including insurance. Wealth Management is a global business with an active presence in markets across Canada, the United States, Europe, the Middle East and Africa (“EMEA”), and Asia. BMO Capital Markets is a North American-based financial services provider offering a complete range of products and services to corporate, institutional and government clients. These include equity and debt underwriting, institutional sales and trading, corporate lending and project financing, mergers and acquisitions advisory services, securitization, treasury management, risk management and equity and fixed income research. Corporate Services consists of Corporate Units and Technology and Operations (“T&O”). Corporate Units provide enterprise-wide expertise and governance support in a variety of areas, including strategic planning, risk management, finance, legal and regulatory compliance, human resources, communications, marketing, real estate, procurement, data and analytics, and innovation. T&O manages, maintains and provides governance over information technology, cyber security and operations services for BFG. Additional information about the Bank is available by accessing the Bank’s public filings with the SEC, file number 001-13354. Relationship Between the Initial Depositor and the Trust. The Trust issues Gold Deposit Receipts and uses the proceeds of such issuances to purchase Gold Bullion from Bank of Montreal. The amount paid per ounce of Gold Bullion by the Trust is equal to the spot price at the time of sale to the investor for one troy ounce of Gold Bullion, determined by BMO Capital Markets Corp. using EBS, an offering of EBS BrokerTec (“EBS”), as the source for the spot price of gold, without adjustment or modification. Any deposit fees are remitted promptly to Bank of Montreal which pays all of the Trust’s expenses. The Gold Bullion purchased from Bank of Montreal is held in Bank of Montreal’s account at the Mint, on behalf of the Trust for the benefit of the holders of the Gold Deposit Receipts. The Mint. The Mint is a Canadian Crown Corporation, incorporated in 1969 by the Royal Canadian Mint Act and is an agent corporation of Her Majesty in right of Canada. Bank of Montreal’s account at the Mint is governed by the gold storage agreement between the Mint and Bank of Montreal (the “Gold Storage Agreement”). The Mint carries such insurance as it deems appropriate for its businesses and its position as custodian of the Trust’s Gold Bullion. Based on information provided by the Mint, we believe that the insurance carried by the Mint, together with its status as a Canadian Crown corporation with its obligations generally constituting unconditional obligations of the Government of Canada, provides the Trust with such protection in the event of loss or theft of the Trust’s Gold Bullion stored at the Mint that is consistent with the protection afforded under insurance carried by other custodians that store gold commercially. In addition, if the Mint were to become a private enterprise, Bank of Montreal on behalf of the Trust will make a determination whether the Mint should remain the custodian of the Trust’s Gold Bullion in light of applicable circumstances, such as the level of insurance carried by the Mint after such privatization, the availability of other custodians and the risk in moving the Trust’s Gold Bullion to another custodian. The objective of the Trust is to provide a secure and convenient way for investors to make an investment in unencumbered, allocated Gold Bullion on a spot basis. As a result, at any given time, the value of the Gold Deposit Receipts is intended to reflect the spot price of gold held by the Trust for the holders of Gold Deposit Receipts. The Trust is not actively managed and has no officers or employees. The Trust does not engage in any activities designed to obtain a profit from, or to prevent losses caused by, changes in the spot price of gold. The Trust issues Gold Deposit Receipts upon the contribution by Bank of Montreal to the Trust of a fixed quantity of Gold Bullion purchased with the proceeds, less the deposit fee and any sales fee, from the sale of Gold Deposit Receipts. Bank of Montreal holds the Gold Bullion in an account that is operated by Bank of Montreal at the Mint in custody for the holders of Gold Deposit Receipts. BMO Capital Markets Corp. acts as the Underwriter for the sale of Gold Deposit Receipts, pursuant to the Second Amended and Restated Distribution Agreement dated July 11, 2018, among the Trust, Bank of Montreal and BMO Capital Markets Corp. (the “Distribution Agreement”). BMO Capital Markets Corp. has entered, and will continue to enter, into dealer agreements with certain third parties that are registered broker-dealers, or banks or trust companies regulated by the Office of the Comptroller of the Currency and/or one or more state banking regulators that are either direct or indirect DTC Participants. We refer to these third parties, as well as any other dealer that becomes a party to the distribution agreement, as “Authorized Participants.” Only Authorized Participants will be involved in the distribution of Gold Deposit Receipts. Holders of Gold Deposit Receipts may elect to redeem their Gold Deposit Receipts for Gold Bullion or exchange their Gold Deposit Receipts for cash either through an Authorized Participant or through an approved registered broker-dealer or similar entity that is not an Authorized Participant. General. The Depositary Trust Agreement provides that the Gold Deposit Receipts represent the owner’s undivided beneficial ownership interest in the Trust assets. The Trustee. The Bank of New York Mellon serves as Trustee. The Bank of New York Mellon, which was founded in 1784, was New York’s first bank and is the oldest bank in the country still operating under its original name. The Bank of New York Mellon is organized under the law of the State of New York authorized to conduct a banking business and a member of the Federal Reserve System. The Bank of New York Mellon conducts a national and international wholesale banking business and a retail banking business in the New York City, New Jersey and Connecticut areas, and provides a comprehensive range of corporate and personal trust, securities processing and investment services. Termination of the Trust. The Trust will terminate if: (i) the Trustee resigns and no successor trustee is appointed by Bank of Montreal, as Initial Depositor, within 60 days from the date the Trustee provides notice to Bank of Montreal, as Initial Depositor, and BMO Capital Markets Corp., as Underwriter, of its intent to resign; (ii) the owners of 75 percent of the outstanding Gold Deposit Receipts (other than those held by Bank of Montreal for its own account) acting through an Authorized Participant vote to dissolve and liquidate the Trust; (iii) an event of liquidation or dissolution occurs as to Bank of Montreal; (iv) Bank of Montreal ceases to store Gold Bullion at the Mint and does not make alternative arrangements that it deems appropriate; or (v) if the Trust fails to qualify for treatment, or ceases to be treated, for U.S. federal income tax purposes, as a grantor trust. If a termination event occurs, the beneficial owners of Gold Deposit Receipts will surrender their Gold Deposit Receipts as provided in the Depositary Trust Agreement, including payment of any fees of the trustee or applicable taxes or governmental charges due. The Initial Depositor will sell the Gold Bullion and the Trustee will deliver to you the resulting proceeds as promptly as practicable after the termination event occurs. Amendment of the Depositary Trust Agreement. The Trustee and Bank of Montreal, as Initial Depositor, may amend any provisions of the Depositary Trust Agreement without the consent of any of the owners of the Gold Deposit Receipts. Promptly after the execution of any amendment to the Depositary Trust Agreement, Bank of Montreal, as Initial Depositor, must furnish or cause to be furnished written notification of the substance of the amendment to each owner of Gold Deposit Receipts. Any amendment that imposes or increases any fees or charges, subject to exceptions, or that otherwise prejudices any substantial existing right of the owners of Gold Deposit Receipts will not become effective until 30 days after notice of the amendment is given to the owners of Gold Deposit Receipts. Listing. The Gold Deposit Receipts are not listed or traded on any securities exchange. Trustee Fees. The fees of The Bank of New York Mellon are borne by Bank of Montreal. Address of the Trustee. The Bank of New York Mellon, Corporate Trust Department, 101 Barclay Street, Floor 7 East, New York, New York 10286. About the Gold Bullion. Subject to the terms of the Gold Storage Agreement, Bank of Montreal, in its sole and absolute discretion, will determine whether the Gold Bullion holdings in its account with the Mint are in coin, bar, wafer, or ingot form. For purposes of this annual report, “allocated” means that the Gold Bullion is segregated and identifiable from all other metal held at the Mint and segregated from Bank of Montreal’s assets. Title to the Gold Bullion is unencumbered and secure in Bank of Montreal’s custody account. The Gold Bullion will be purchased on a daily basis on behalf of holders, and will be allocated to the Trust and held in Bank of Montreal’s account at the Mint. Specifications of the Gold Bullion. All Gold Bullion will be unencumbered, allocated, and physical with a minimum fineness of 995 parts per 1000. If the Gold Bullion is in coin form, each coin will also: (i) have been produced by the Mint and be legal tender in Canada for its denomination; and (ii) have a fair market value not exceeding 110 percent of the fair market value of the coin’s gold content. If the Gold Bullion is in bar, wafer, or ingot form, the Gold Bullion will also (i) have been fabricated by a metal refiner included in the London Bullion Market Association’s (the “LBMA”) good delivery list of acceptable refiners for gold; and (ii) bear basic identification markings that are recognized and accepted for trading in Canadian financial markets, including the hallmark of the metal refiner that produced it and a stamp indicating its fineness and weight, and no other markings. In its account at the Mint, Bank of Montreal will not use or hold unallocated gold, gold certificates, exchange-traded products, derivatives, financial instruments, or any product that represents encumbered gold. Bank of Montreal and its affiliates will not lend, pledge, hypothecate or otherwise encumber any of the Gold Bullion. Ownership of Gold Bullion. The Gold Bullion purchased on behalf of holders is held at the Mint in Bank of Montreal’s account for the benefit of the holders. Consequently under Canadian federal law, the Gold Bullion held by the Trust would not be available to meet the claims of creditors of Bank of Montreal in the event of any bankruptcy, insolvency or similar event involving Bank of Montreal. The Trust is an “emerging growth company,” as defined in the Jumpstart Our Business Startups Act (the “JOBS Act”). For as long as the Trust is an “emerging growth company,” the Trust may take advantage of certain exemptions from various reporting requirements that are applicable to other public companies that are not “emerging growth companies,” including, but not limited to, not being required to comply with the auditor attestation requirements of Section 404(b) of the Sarbanes-Oxley Act of 2002 (the “Sarbanes-Oxley Act”), reduced disclosure obligations regarding executive compensation in the Trust’s periodic reports, and exemptions from the requirements of holding advisory “say-on-pay” votes on executive compensation and shareholder advisory votes on golden parachute compensation. · the date on which the Trust is deemed to be a large accelerated filer under the Securities Exchange Act of 1934, as amended (the Exchange Act) (the Trust will qualify as a large accelerated filer as of the first day of the first fiscal year after the Trust has (i) more than $700 million in outstanding equity held by non-affiliates and (ii) been public for at least 12 months; the value of its outstanding equity will be measured each year on the last day of its second fiscal quarter). The JOBS Act also provides that an “emerging growth company” can utilize the extended transition period provided in Section 7(a) (2)(B) of the Securities Act of 1933, as amended for complying with new or revised accounting standards. However, the Trust has chosen to “opt out” of such extended transition period, and, as a result, the Trust will comply with new or revised accounting standards on the relevant dates on which adoption of such standards is required for companies that are not “emerging growth companies.” Section 107 of the JOBS Act provides that the Trust’s decision to opt out of the extended transition period for complying with new or revised accounting standards is irrevocable. Bank of Montreal has a limited history of operating investment vehicles similar to the Trust. Its experience may be inadequate or unsuitable to manage the Trust. Bank of Montreal has a limited history of operating investment vehicles like the Trust. Bank of Montreal’s performance in connection with sponsoring or managing other investment vehicles is not indicative of its ability to sponsor the Trust. The value of the Gold Deposit Receipts relates directly to the value of the Gold Bullion held by the Trust and fluctuations in the price of gold could materially adversely affect an investment in the Gold Deposit Receipts. The Gold Deposit Receipts are designed to mirror as closely as possible the performance of the price of gold, and the value of the Gold Deposit Receipts relates directly to the value of the Gold Bullion held by the Trust. The price of gold has fluctuated widely over the past several years. · Investment and trading activities of hedge funds and commodity funds. Throughout 2017, gold prices experienced notable volatility. In the first half of 2017, the average physical demand was up 17 percent compared to the same period a year earlier. In September 2017, gold prices rose to their highest levels for a thirteen-month period, then fell to a near five-month low of $1,240.90 by the end of the year. Gold started 2018 strong but its rally hit a barrier just below $1,360.00 in late January 2018. The price of gold fell to its lowest level since the beginning of 2017 in mid-August 2018 at $1,178.40. Throughout 2018, individual supply and demand elements saw dramatic fluctuations. If gold markets continue to be subject to sharp fluctuations, the price of the Gold Deposit Receipts may experience significant price fluctuation and this may result in losses if you need to sell your Gold Deposit Receipts at a time when the price of gold is lower than it was when you made your investment. Even if you are able to hold Gold Deposit Receipts for the long-term, you may never experience a profit, since gold markets have historically experienced extended periods of flat or declining prices, in addition to sharp fluctuations. In addition, investors should be aware that there is no assurance that gold will maintain its long-term value in terms of purchasing power in the future. In the event that the price of gold declines, the Initial Depositor expects the value of an investment in the Gold Deposit Receipts to decline proportionately. The value of Gold Bullion is not guaranteed, which may cause your investment in the Gold Deposit Receipts to be volatile. An investment in Gold Bullion is speculative and may be subject to greater price volatility than other investments. Appreciation in the market price of gold is the sole manner in which you can realize gains. Past performance of the price of gold is not indicative of future performance. Bank of Montreal does not provide any guarantee as to the value of Gold Bullion, which may be affected by many international, economic, monetary and political factors, many of which are unpredictable. Future governmental decisions may have significant impact on the price of Gold Bullion, which will impact the price of the Gold Deposit Receipts. Generally, gold prices reflect the supply and demand of available Gold Bullion. Governmental decisions, such as the executive order issued by the President of the United States in 1933 requiring all persons in the United States to deliver Gold Bullion to the Federal Reserve or the abandonment of the gold standard by the United States in 1971, have been viewed as having a significant impact on the supply and demand of Gold Bullion and the price of Gold Bullion. Other more recent governmental actions have indirectly impacted the price of Gold Bullion, such as the United Kingdom’s referendum held on June 23, 2016 to leave the European Union (i.e., Brexit). Future governmental decisions, whether in the United States, Canada or other relevant jurisdictions, may, either directly or indirectly, have an impact on the price of Gold Bullion, and may result in a significant decrease or increase in the value of the Gold Bullion and the Gold Deposit Receipts. Disruptions in trading may materially adversely affect the Gold Deposit Receipts. Occasional disruptions in trading, including temporary distortions or other disruptions due to various factors, such as the lack of liquidity in markets, the participation of speculators and governmental regulation and intervention may result in a significant decrease or increase in the value of Gold Bullion, which will affect the Gold Deposit Receipts. The Trust is a passive investment vehicle. This means that the value of the Gold Deposit Receipts may be adversely affected by Trust losses that, if the Trust had been actively managed, it might have been possible to avoid. The Trustee does not actively manage the gold held by the Trust. This means that the Trustee does not sell gold at times when its price is high, or acquire gold at low prices in the expectation of future price increases. It also means that the Trustee does not make use of any of the hedging techniques available to professional gold investors to attempt to reduce the risks of losses resulting from price decreases. Any losses sustained by the Trust will adversely affect the value of the Gold Deposit Receipts. Because the Trust holds solely Gold Bullion, an investment in the Trust may be more volatile than an investment in a more broadly diversified portfolio. The Trust holds solely Gold Bullion for the benefit of the holders of the Gold Deposit Receipts. As a result, the Trust’s holdings are not diversified. Accordingly, the asset value of the Trust may be more volatile than another investment vehicle with a broadly diversified portfolio and may fluctuate substantially over time. Crises may motivate large-scale sales of gold which could decrease the price of gold and adversely affect an investment in the Gold Deposit Receipts. The possibility of large-scale distressed sales of gold in times of crisis may have a short-term negative impact on the price of gold and adversely affect an investment in the Gold Deposit Receipts. For example, the 1998 Asian financial crisis resulted in significant sales of gold by individuals, which depressed the price of gold. Crises in the future may impair gold’s price performance which would, in turn, adversely affect an investment in the Gold Deposit Receipts. Purchasing activity in the gold market associated with the delivery of Gold Bullion to the Trust in exchange for Gold Deposit Receipts may cause a temporary increase in the price of gold. This increase may adversely affect an investment in the Gold Deposit Receipts. Purchasing activity associated with acquiring the Gold Bullion that is transferred into the Trust in connection with the issuance of additional Gold Deposit Receipts may temporarily increase the market price of gold, which will result in higher prices for the Gold Deposit Receipts. Temporary increases in the market price of gold may also occur as a result of the purchasing activity of other market participants. Other market participants may attempt to benefit from an increase in the market price of gold that may result from increased purchasing activity of gold connected with the issuance of Gold Deposit Receipts. Consequently, the market price of gold may decline immediately after Gold Deposit Receipts are purchased. If the price of gold declines, the trading price of the Gold Deposit Receipts will also decline. Holders of Gold Deposit Receipts do not have the protections associated with ownership of interests in an investment company registered under the 1940 Act or the protections afforded by the CEA. The Trust is not registered as an investment company under the 1940 Act and is not required to register under such act. Consequently, holders of Gold Deposit Receipts do not have the regulatory protections provided to investors in investment companies. The Trust will not hold or trade commodity interests regulated by the CEA, as administered by the CFTC. Furthermore, the Trust is not a commodity pool for purposes of the CEA, and none of the Initial Depositor, the Trustee or the Authorized Participants is subject to regulation by the CFTC in any capacity, including as a commodity pool operator or a commodity trading advisor in connection with the Gold Deposit Receipts. Consequently, holders of Gold Deposit Receipts do not have the regulatory protections provided to investors in CEA-regulated instruments or commodity pools. The Trust may be required to terminate and liquidate at a time that is disadvantageous to holders. If the Trust is required to terminate and liquidate, such termination and liquidation could occur at a time which is disadvantageous to holders, such as when gold prices are lower than the gold prices at the time when holders purchased their Gold Deposit Receipts. In such a case, when the Trust’s Gold Bullion is sold as part of the Trust’s liquidation, the resulting proceeds distributed to holders will be less than if gold prices were higher at the time of sale. The price of gold may be affected by the sale of gold by exchange-traded funds or other exchange-traded vehicles tracking gold markets. To the extent existing exchange-traded funds, or ETFs, or other exchange-traded vehicles tracking gold markets represent a significant proportion of demand for Gold Bullion, large redemptions of the securities of these ETFs or other exchange-traded vehicles could negatively affect Gold Bullion prices and the price of the Gold Deposit Receipts. An investment in the Gold Deposit Receipts may be adversely affected by competition from other methods of investing in gold. The Trust competes with other financial vehicles, including traditional debt and equity securities issued by gold industry participants and direct investments in gold. Market and financial conditions, and other conditions beyond Bank of Montreal’s control, may make it more attractive to invest in other financial vehicles or to invest in gold directly, which could limit the market for the Gold Deposit Receipts and reduce the liquidity of the Gold Deposit Receipts. The Trust may postpone, suspend or reject redemption requests in certain circumstances, which may limit the ability of a holder of Gold Deposit Receipts to obtain liquidity. If notified by Bank of Montreal or BMO Capital Markets Corp. of any postponement, suspension or rejection of settlement, the Trustee shall suspend the redemption right or postpone the settlement date for any redemption to have physical gold delivery for you. Any such postponement, suspension or rejection may affect a holder’s ability to obtain liquidity. Under the Depositary Trust Agreement, the Initial Depositor, the Trustee and the Underwriter have no liability for any loss or damage that may result from any such suspension or postponement. Physical delivery may be suspended generally, or refused with respect to particular requested deliveries only in the case of a force majeure event or market disruption event where the Initial Depositor is prevented for reasons outside of its control from delivering the Gold Bullion, and such suspension or refusal shall only last so long as the Initial Depositor continues to be so prevented from delivering the Gold Bullion. Redemptions or repurchases of Gold Deposit Receipts by the Initial Depositor for Cash Delivery may be suspended at any time as a result of suspensions in the purchase of Gold Bullion by Bank of Montreal. As a holder of Gold Deposit Receipts, you will only have the option to elect that Bank of Montreal repurchase the withdrawn Gold Bullion represented by your Gold Deposit Receipts for cash if Bank of Montreal is then effecting such purchases, but Bank of Montreal is under no obligation to do so. Accordingly, you should only purchase the Gold Deposit Receipts if you are prepared to maintain an ownership interest in the Gold Deposit Receipts for an indefinite period. Bank of Montreal does not have any obligation to the Trust or to any holder of Gold Deposit Receipts to repurchase Gold Bullion at any time. In the event that a holder redeems Gold Deposit Receipts for cash or physical gold, an Authorized Participant or other broker-dealer that processes that transaction may charge additional fees. Holders who redeem their Gold Deposit Receipts for cash or physical gold using the services of an Authorized Participant or other broker-dealer (for example, the holder’s broker) may be charged additional fees or commissions by that Authorized Participant or other broker-dealer. No additional fees (other than any applicable withdrawal and delivery fee in connection with the delivery of physical gold) will be charged by Bank of Montreal, the Trust or BMO Capital Markets Corp. Physical delivery of Gold Bullion is not available in every state, and the states approved for delivery may change at any time. Gold Bullion will be delivered only to addresses within the United States that are within a state specifically approved by the Underwriter for delivery. The Initial Depositor will maintain a list of states approved for delivery and provide the same to the Authorized Participants from time to time. The Initial Depositor has no obligation to deliver Gold Bullion to a state that is not approved for delivery, and there is no guarantee that delivery will remain available in any particular state. If an investor changes its address to a state that is not approved for delivery, delivery will no longer be available to that investor. A request for sale or redemption is irrevocable. In order to sell or redeem Gold Deposit Receipts for cash or physical gold, a holder must provide a notice to the Trust through an Authorized Participant or other broker-dealer. Except when sales or redemptions have been suspended, once a notice has been received, it can no longer be revoked by the holder under any circumstances, though it may be rejected by the Trust if it does not comply with the requirements for such notice. The fees charged to holders for redemption of their Gold Deposit Receipts may change. If you choose to redeem your Gold Deposit Receipts for physical gold, you will be responsible for payment of certain fees and expenses. The fees and expenses may be increased or decreased by Bank of Montreal in its sole and absolute discretion. Holders do not have the rights enjoyed by investors in certain other vehicles. As interests in the Gold Bullion held by the Trust, the Gold Deposit Receipts have none of the statutory rights normally associated with the ownership of shares of a corporation (including, for example, the right to bring “derivative” actions). In addition, the Gold Deposit Receipts have limited voting and distribution rights (for example, holders do not have the right to elect directors and will not receive dividends). Each of the parties to the offering of Gold Deposit Receipts maintains several roles, which may present certain conflicts of interest. Bank of Montreal is the Initial Depositor of the Trust and holds Gold Bullion that it will transfer to the Trust from time to time in connection with the sale by the Trust of the Gold Deposit Receipts. The price at which Gold Deposit Receipts are sold to the public is equal to the price at which Gold Bullion is transferred to the Trust by Bank of Montreal. Transactions in the Gold Deposit Receipts will be executed promptly by BMO Capital Markets Corp. and Bank of Montreal. Bank of Montreal may earn revenues (or suffer losses) from the sale of Gold Bullion to the Trust. As discussed above, under “Purchasing activity in the gold market associated with the delivery of Gold Bullion to the Trust in exchange for Gold Deposit Receipts may cause a temporary increase in the price of gold. This increase may adversely affect an investment in the Gold Deposit Receipts,” activity in the gold market may affect the price of Gold Deposit Receipts. In addition to acting as the Initial Depositor, Bank of Montreal also redeems the Gold Deposit Receipts for Gold Bullion and purchases the Gold Deposit Receipts for cash. Furthermore, BMO Capital Markets Corp. acts as the Underwriter of the continuous offerings of Gold Deposit Receipts and as the calculation agent responsible for calculating the spot price of gold, using the spot price of gold reflected on EBS as the source for the spot price of gold, without adjustment or modification. Each party plays various roles, which may give rise to certain conflicts of interest of which you should be aware. Substantial sales of gold by the official sector could adversely affect an investment in the Gold Deposit Receipts. The official sector consists of central banks, other governmental agencies and multi-lateral institutions that buy, sell and hold gold as part of their reserve assets. The official sector holds a significant amount of gold, most of which is static, meaning that it is held in vaults and is not bought, sold, leased or swapped or otherwise mobilized in the open market. A number of central banks have sold portions of their gold over the past ten years, with the result that the official sector, taken as a whole, has been a net supplier to the open market. Since 1999, most sales have been made in a coordinated manner under the terms of the Central Bank Gold Agreement under which 15 of the world’s major central banks agree to limit the level of their gold sales and lending to the market. In the event that future economic, political or social conditions or pressures require members of the official sector to liquidate their gold assets all at once or in an uncoordinated manner, the demand for gold might not be sufficient to accommodate the sudden increase in the supply of gold to the market. Consequently, the price of gold could decline significantly, which would adversely affect an investment in the Gold Deposit Receipts. The Trust does not insure its assets and there may not be adequate sources of recovery if its Gold Bullion is lost, damaged, stolen or destroyed. The Trust does not insure its assets, including the Gold Bullion stored at the Mint. Consequently, if there is a loss of assets of the Trust through theft, destruction, fraud or otherwise, the Trust and holders will need to rely on insurance carried by applicable third parties, if any, or on such third party’s ability to satisfy any claims against it. The amount of insurance available or the financial resources of a responsible third party may not be sufficient to satisfy the Trust’s claim against such party. Also, holders of Gold Deposit Receipts are unlikely to have any right to assert a claim directly against such third party; such claims may only be asserted by the Trustee on behalf of the Trust. In addition, if a loss is covered by insurance carried by a third party, the Trust, which is not a beneficiary on such insurance, may have to rely on the efforts of the third party to recover its loss. This may delay or hinder the Trust’s ability to recover its loss in a timely manner or otherwise. A loss with respect to the Trust’s Gold Bullion that is not covered by insurance and for which compensatory damages cannot be recovered would have a negative impact on the Gold Deposit Receipts and would adversely affect an investment in the Gold Deposit Receipts. In addition, any event of loss may adversely affect the operations of the Trust and, consequently, an investment in the Gold Deposit Receipts. A redeeming holder of the Gold Deposit Receipt that suffers loss of, or damage to, its Gold Bullion during delivery will not be able to claim damages from the Service Carrier, Bank of Montreal, the Trust or the storage provider. If a holder of Gold Deposit Receipts exercises its option to redeem Gold Deposit Receipts for Gold Bullion, the holder’s Gold Bullion will be transported by a third-party service carrier (“Service Carrier”). Because ownership of Gold Bullion will transfer to such holder at the time Bank of Montreal surrenders the Gold Bullion to the Service Carrier, the redeeming holder will bear the risk of loss from the moment the Service Carrier takes possession of the Gold Bullion on behalf of such holder. Under the terms of the Gold Carrier Agreement, in the event of any loss or damage in connection with the delivery of the Gold Bullion, such holder will not be able to claim damages from the Service Carrier, nor will such holder be able to claim damages from Bank of Montreal, the Trust or the Mint. Bank of Montreal, the Mint and service providers engaged by the Trust may not carry adequate insurance to cover claims against them by the Trust. Holders cannot be assured that Bank of Montreal, the Mint or service providers engaged by the Trust will maintain insurance with respect to the Trust’s assets or the services that such parties provide to the Trust and, if they maintain insurance, that such insurance is sufficient to satisfy any losses incurred by them in respect of their relationship with the Trust. The Mint, to the extent it incurs any liability, will be liable only to Bank of Montreal directly in the event of loss, damage or destruction of the Trust’s Gold Bullion. In addition, none of the Trust’s service providers are required to include the Trust as a named beneficiary of any such insurance policies that are purchased. Accordingly, the Trust will have to rely on the efforts of the service provider to recover from their insurer compensation for any losses incurred by the Trust in connection with such arrangements. If there is a loss, damage or destruction of the Trust’s Gold Bullion in the custody of the Mint and Bank of Montreal does not give timely notice, all claims against the Mint will be deemed waived. In the event of loss, damage or destruction of the Trust’s Gold Bullion in the Mint’s custody, care and control, Bank of Montreal must give written notice to the Mint within five Mint business days (a Mint business day means any day other than a Saturday, Sunday or a holiday observed by the Mint) after the discovery by Bank of Montreal of any such loss, damage or destruction, but in any event no more than 30 days after the delivery by the Mint to Bank of Montreal of an inventory statement in which the discrepancy first appears. If such notice is not given in a timely manner, all claims against the Mint will be deemed to have been waived. In addition, no action, suit or other proceeding to recover any loss or shortage can be brought against the Mint unless timely notice of such loss or shortage has been given and such action, suit or proceeding will have commenced within 12 months from the time a claim is made. The loss of the right to make a claim or of the ability to bring an action, suit or other proceeding against the Mint may mean that any such loss will be non-recoverable, which will have an adverse effect on the value of the net assets of the Trust. The Trustee and Trust shall have no responsibility or liability for actions taken by the Initial Depositor or the Mint. Pursuant to the terms of the Depositary Trust Agreement, neither the Trustee nor the Trust can be held responsible, or liable, for any misconduct, bad faith or negligence of the Initial Depositor or the Mint. The Trust is exposed to various operational risks. The Trust is exposed to various operational risks, including information technology failures, human error and failures to comply with procedures intended to mitigate such risks. Under Canadian law, the Trust may have limited recourse against the Mint. The Mint is a Canadian Crown corporation. A Canadian Crown corporation may be sued for breach of contract or for wrongdoing in tort where it has acted on its own behalf or on behalf of the Crown. However, a Canadian Crown corporation may be entitled to immunity if it acts as agent of the Crown rather than in its own right and on its own behalf. The Mint has entered into the Gold Storage Agreement between Bank of Montreal and the Mint relating to the custody of the Gold Bullion in Bank of Montreal’s account for the Trust. The Mint has entered into this agreement on its own behalf and not on behalf of the Crown; nevertheless, a court may determine that, when acting as custodian of the Trust’s Gold Bullion, the Mint acted as agent of the Crown and, accordingly, that the Mint may be entitled to immunity of the Crown. Consequently, the Trust or a holder of Gold Deposit Receipts may not be able to recover for any losses incurred as a result of the Mint’s acting as custodian of the Gold Bullion. The Mint may become a private enterprise, in which case its obligations will not constitute the unconditional obligations of the Government of Canada. In the past, there has been speculation regarding whether the Government of Canada might privatize the Mint. The Mint will not remain a Canadian Crown corporation if the Government of Canada privatizes the Mint. If the Mint were to become a private entity, its obligations would no longer generally constitute unconditional obligations of the Government of Canada and, although it would continue to be responsible for and bear the risk of loss of, and damage to, the Trust’s Gold Bullion that is in its custody, there would be no assurance that the Mint would have the resources to satisfy claims of the Trust against the Mint based on a loss of, or damage to, the Trust’s Gold Bullion in the custody of the Mint. An investment in Gold Bullion may not be appropriate for all investors. You should decide to buy the Gold Deposit Receipts, which constitute an investment in Gold Bullion, only after carefully considering with your investment or financial advisor whether Gold Bullion is a suitable investment in light of the information contained in this annual report having regard to your financial or investment objectives and expectations. Changes in laws or regulations may affect the Gold Deposit Receipts and the Gold Bullion. The promulgation of new laws or regulations or by the reinterpretation of existing laws or regulations (including, without limitation, those relating to taxes and duties on commodities or commodity components) by one or more governments, governmental agencies or instrumentalities, courts, or other official bodies may result in a significant decrease or increase in the value of the Gold Deposit Receipts and the Gold Bullion. The United States or foreign governments may pass laws or regulations limiting metal investments for strategic or other policy reasons. Potential risks could arise with respect to the Trust and the holders of Gold Deposit Receipts from an insolvency event relating to Bank of Montreal. The Gold Deposit Receipts represent interests in Gold Bullion held by the Trust. The Gold Bullion is held by the Trust on behalf of purchasers and held at an account of Bank of Montreal with the Mint. The Gold Bullion is not, and will not, be owned by Bank of Montreal. Consequently, under Canadian federal law, the Gold Bullion would not be available to meet the claims of creditors of Bank of Montreal in the event of any bankruptcy, insolvency or similar event involving Bank of Montreal. However, any such event could lead to delays in restoring the ability of holders of Gold Deposit Receipts to transact in such Gold Bullion, depending upon the outcome of any relevant bankruptcy or related proceedings. Transactions through an Authorized Participant or other broker-dealer are subject to risks related to that Authorized Participant or other broker-dealer. All transactions in the Gold Deposit Receipts will take place through an Authorized Participant or other broker-dealer, and you assume the risks of the Authorized Participant’s or broker-dealer’s failure to fulfill its obligations to you. The Gold Deposit Receipts are not subject to deposit insurance. The Gold Deposit Receipts are not securities of The Bank of New York Mellon, BNY Mellon Trust of Delaware, Bank of Montreal or any other bank, and do not constitute deposits that are insured under the U.S. Federal Deposit Insurance Act, the Canada Deposit Insurance Corporation Act or any other deposit insurance regime. There is no assurance that your investment in the Gold Deposit Receipts will be subject to protection by the Securities Investor Protection Corporation. In the case of the failure of a brokerage firm that is a member of the Securities Investor Protection Corporation (the “SIPC”), the SIPC would protect customers against the loss of cash and securities. The SIPC does not protect commodity or related futures contracts or investment contracts. The Gold Deposit Receipts are not commodity futures or investment contracts. In the opinion of Mayer Brown LLP, the Gold Deposit Receipts should be viewed as securities for which SIPC protection should be available. However, given that the Gold Deposit Receipts are novel instruments, there can be no assurance that the SIPC or a court having jurisdiction on this matter would concur with this legal conclusion. The Trust is an “emerging growth company” and it cannot be certain if the reduced disclosure requirements applicable to emerging growth companies will make the Gold Deposit Receipts less attractive to investors. · exemption from any rules requiring mandatory audit firm rotation and auditor discussion and analysis and, unless the SEC otherwise determines, any future audit rules that may be adopted by the Public Company Accounting Oversight Board. The Trust could be an emerging growth company until October 31, 2021, the last day of the Trust’s fiscal year following the fifth anniversary after its initial public offering, or until the earliest of: (i) the last day of the fiscal year in which it has annual gross revenue of $1.07 billion or more; (ii) the date on which it has, during the previous three year period, issued more than $1 billion in non-convertible debt; or (iii) the date on which it is deemed to be a large accelerated filer under the federal securities laws. The Trust will qualify as a large accelerated filer as of the first day of the first fiscal year after it has (i) more than $700 million in outstanding equity held by non-affiliates and (ii) been public for at least 12 months. The value of the Trust’s outstanding equity will be measured each year on the last day of its second fiscal quarter. Under the JOBS Act, emerging growth companies are also permitted to elect to delay adoption of new or revised accounting standards until companies that are not subject to periodic reporting obligations are required to comply, if such accounting standards apply to non-reporting companies. The Trust has made an irrevocable decision to opt out of this extended transition period for complying with new or revised accounting standards. The Trust cannot predict if investors will find an investment in the Trust less attractive if it relies on these exemptions. You should consider the applicable tax consequences of an investment in the Gold Deposit Receipts, and indirectly, in Gold Bullion. You should consult with your own tax advisors in order to determine the impact of applicable taxes on your investment. The property of the Trust consists of the Gold Bullion and all monies or other property, if any, received by the Trustee. The Trust holds Gold Bullion for the benefit of owners of Gold Deposit Receipts. One Gold Deposit Receipt represents the undivided beneficial ownership of one troy ounce of Gold Bullion. The Trustee performs only administrative and ministerial acts. The property of the Trust consists of the Gold Bullion and all monies or other property, if any, received by the Trustee. The Initial Depositor sells Gold Bullion to the Trust and arranges custodial services through its gold storage account. As of October 31, 2018, there were 153,304 Gold Deposit Receipts outstanding. The Trust is not managed like a corporation or an active investment vehicle. It does not have any officers, directors, or employees and is administered by the Trustee pursuant to the Depositary Trust Agreement. The expenses of the Trust are borne by the Initial Depositor. The fiscal year end for the Trust is October 31. The participants in the gold industry may be classified in the following sectors: (1) mining and producer; (2) banking; (3) official; (4) investment; and (5) manufacturing. The following is a brief description of each of the sectors. Mining and Producer Sector. This group includes mining companies that specialize in gold and silver production; mining companies that produce gold as a byproduct of other production (such as a copper or silver producer); scrap merchants; and recyclers. Banking Sector. Bullion banks provide a variety of services to the gold industry and its participants, thereby facilitating interactions between other parties. Services provided by the bullion banking community include traditional banking products as well as mine financing, physical gold purchases and sales, hedging and risk management, inventory management for industrial users and consumers, and gold deposit and loan instruments. The Official Sector. The official sector encompasses the activities of the various central banking operations of gold-holding countries. In September 1999, a group of 15 central banks acting to clarify their intentions with respect to their gold holdings signed the Central Bank Gold Agreement commonly called the “Washington Agreement on Gold.” The signatories included the European Central Bank (the “ECB”) and the central banks of Austria, Belgium, Finland, France, Germany, Ireland, Italy, Luxembourg, the Netherlands, Portugal, Spain, Sweden, Switzerland, and England. The original agreement limited incremental sales by the 15 signatories to 400 tonnes per annum over the ensuing five-year period. The original Washington Agreement on Gold expired in September 2004, and was renewed by almost all of the original signatories for a second five-year period (England did not renew in 2004). The second Washington Accord Agreement expired in September 2009 and was renewed again by all signatories of the second agreement for a third agreement to last another five-year period. In addition, the central banks of Cyprus, Greece, Malta, Slovakia and Slovenia signed in 2009. The annum limit on gold sales under the third agreement was 400 tonnes, with total sales not to exceed 2,000 tonnes in the five-year period. In May 2014, before the third agreement was set to expire in September 2014, a fourth agreement was reached between the ECB and the central banks of Austria, Belgium, Cyprus, Estonia, Finland, France, Germany, Greece, Ireland, Italy, Latvia, Luxembourg, Malta, the Netherlands, Portugal, Slovakia, Slovenia, Spain, Sweden and Switzerland, which will expire after a five-year period. The signatories have agreed to, among other things, continue to coordinate their gold transactions to avoid disturbances to the gold market and have acknowledged that they each do not have plans to sell significant amounts of gold. The Investment Sector. This sector includes the investment and trading activities of both professional and private investors and speculators. These participants range from large hedge and mutual funds to day-traders on futures exchanges and retail-level coin collectors. The Manufacturing Sector. The fabrication and manufacturing sector represents all the commercial and industrial users of gold for whom gold is a daily part of their business. The jewelry industry is a large user of gold. Other industrial users of gold include the electronics and dental industries. Note: Totals may not add due to independent rounding. Net producer hedging is the change in the physical market impact of mining companies’ gold loans, forwards and options positions. Implied net investment is the residual from combining all other Thomson Reuters GFMS data on the gold supply/demand as shown in the Summary Table. As such, it captures the net physical impact of all transactions not covered by the other supply/demand variables. (1) “Tonne” refers to one metric ton. This is equal to 1,000 kilograms or 32,150.7465 troy ounces. As movements in the price of gold are expected to directly affect the price of the Gold Deposit Receipts, investors should understand what the recent movements in the price of gold have been. Investors, however, should also be aware that past movements in the gold price are not indicators of future movements. The following chart provides historical background on the price of gold. 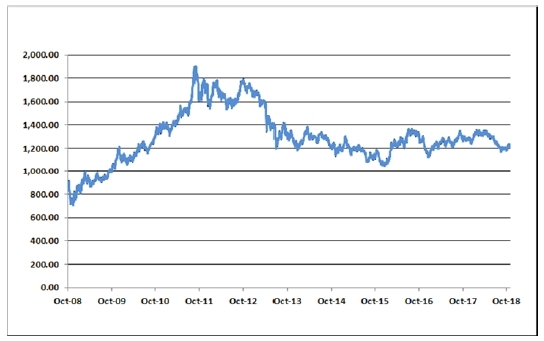 The chart illustrates movements in the price of gold in U.S. dollars per ounce over the period from October 2008 to October 2018, and is based on the LBMA (PM) Gold Price, an offering of ICE Benchmark Administration. In the first quarter of 2008, the price of gold steadily increased and then reached a new high of $1,011.25 on March 17, 2008. By the end of December 2008, however, the price of gold had fallen to $869.75. Gold prices were quite volatile between the March 2008 high and the end of December 2008 with run-ups and falls of over $150 in each direction. The significant price movements reflect the battles between inflationary and deflationary pressures, U.S. Dollar strengthening against many major currencies and global economic uncertainty going into 2009. The price of gold continued its upward trend in 2009. After rallying to $1,212.50 per ounce in early December 2009, it fell back down to $1,087.50 per ounce to close the year following the collapse of Lehman Brothers. This still resulted in a gain of over 25 percent for 2009. Upward price movement for gold price continued in 2010, reaching a new pre-inflation adjusted record high of $1,421.00 per ounce on November 9, 2010 and closing at $1,405.50 per ounce on December 30, 2010. In August 2011, the price of gold experienced a notable increase partially due to the first U.S. downgrade by Standard & Poor’s, reaching a high of $1,895.00 per ounce on September 5, 2011. By December 29, 2011, the price of gold had fallen to $1,531.00 per ounce. The annual average price of gold in 2012 was 6.2 percent higher than 2011, reaching a high of $1,791.75 on October 4, 2012. In particular, uncertainty over U.S. monetary policy became an increasingly significant driver of market appetite towards the end of 2012, and on December 28, 2012, the price of gold had fallen slightly to $1,657.50 per ounce. In 2013, the twelve-year bull run of gold ended. 2013 opened near the annual high, and the price declined approximately 29 percent over the year to $1,204.50 per ounce on December 30, 2013. For 2013, the price of gold was impacted, in part, by improving sentiment towards the U.S. economy, which contributed to a strengthening of the U.S. dollar and equities, luring investors away from gold in the process. During 2014, the underlying driver behind investor sentiment of gold was global monetary policy. On one end, the improving economic conditions in the United States (along with the announcement of the Federal Reserve Board’s tapering measures at the end of 2013) diminished demand for gold for U.S. investors, while loosening of monetary policy in other advanced and emerging markets enhanced demand for gold globally, causing gold prices to fluctuate between a low of $1,132.00 and a high of $1,392.00 per ounce. Gold prices deteriorated throughout 2015, in part as a result of the Federal Reserve Board’s announcement that it would raise interest rates as well as a significant rally of the U.S. dollar index, falling to $1,060.00 per ounce on December 30, 2015. However, the price of gold rebounded during the first half of 2016. In July 2016, gold prices experienced a rapid increase following the United Kingdom’s referendum held on June 23, 2016 to leave the European Union (i.e., “Brexit”), reaching a 28-month high of $1,366.25 per ounce on July 6, 2016. The initial market volatility and negative sentiment in connection with Brexit has somewhat subsided and gold prices have receded from the high prices displayed during July 2016, leveling off at prices similarly exhibited during the beginning of 2016. Gold prices rallied robustly in the first seven months of 2016 before leveling off for much of the third quarter. Gold hit a near eleven-month low price of $1,125.70 per ounce in late December and ended the year 8 percent higher than it started. This lower price followed a few days after the Federal Reserve raised interest rates on December 15, 2016. In the first half of 2017, physical demand was up 17 percent compared to the same period a year earlier. In September 2017, gold prices rose to their highest level for thirteen months, but then slipped to a near five-month low by mid-December. Gold prices near $1,300.00 per ounce in the later half of 2017 indicated that physical demand had slipped compared to prior quarters. The final weeks of 2017 saw gold prices recover the bulk of previous losses as the dollar weakened against other major currencies after the Federal Reserve reiterated that a gradual path of rate increases remained appropriate even in light of the new tax reform. Gold closed at $1,291.00 per ounce on December 28, 2017. Gold started 2018 strongly, extending the rally that followed the Federal Reserve’s interest rate hike in December 2017. This rally hit a barrier just below $1,360.00 in late January. While gold started off to a positive year in 2018, a recovery in the U.S. dollar weakened prices and uncertainty on the U.S-China trade front weakened the yuan, further pulling gold down. In mid-August 2018, the price of gold was at $1,178.40, which was both the lowest price point for the year-to-date and the lowest since the start of 2017. By the end of August, gold prices had gone down approximately 7.7 percent in 2018. A short-covering rally occurred in early October 2018. As of January 25, 2019, the price of gold was $1,293.90 per ounce. The Trust is not aware of any trends, demands, commitments, conditions, events or uncertainties that are reasonably likely to result in material changes to its liquidity needs. In exchange for the Initial Depositor’s fee, the Initial Depositor has agreed to assume the expenses incurred by the Trust. The Trust has no off-balance sheet arrangements. The Trust prepares its financial statements in accordance with accounting principles generally accepted in the United States of America (“GAAP”). The Trust has adopted the provisions of Topic 946, Investment Companies, and follows specialized accounting. As a result of the adoption of this provision, the Trust records its investment in gold at fair value and expects that there will be fluctuations in the value of investments based on changes in the price of gold. The Trust does not engage in transactions in foreign currencies which could expose the Trust or holders of Gold Deposit Receipts to any foreign currency related market risk. The Trust does not invest in any derivative financial instruments or long-term debt instruments. The Trust’s sole business activity is the investment in gold, and substantially all the Trust’s assets are holdings of gold which creates a concentration of risk associated with fluctuations in the price of gold. We have audited the accompanying statements of assets and liabilities of the Vaulted Gold Bullion Trust (the Trust), including the schedules of investments, as of October 31, 2018 and 2017, the related statements of operations and changes in net assets for each of the years ended October 31, 2018 and 2017 and the period from August 5, 2016 (commencement of operations) through October 31, 2016, and the related notes (collectively, the financial statements). In our opinion, the financial statements present fairly, in all material respects, the financial position of the Trust as of October 31, 2018 and 2017, and the results of its operations and changes in its net assets for each of the years ended October 31, 2018 and 2017 and the period from August 5, 2016 through October 31, 2016, in conformity with U.S. generally accepted accounting principles. These financial statements are the responsibility of the Trust’s management. Our responsibility is to express an opinion on these financial statements based on our audits. We are a public accounting firm registered with the Public Company Accounting Oversight Board (United States) (PCAOB) and are required to be independent with respect to the Trust in accordance with the U.S. federal securities laws and the applicable rules and regulations of the Securities and Exchange Commission and the PCAOB. We conducted our audits in accordance with the standards of the PCAOB. Those standards require that we plan and perform the audit to obtain reasonable assurance about whether the financial statements are free of material misstatement, whether due to error or fraud. The Trust is not required to have, nor were we engaged to perform, an audit of its internal control over financial reporting. As part of our audits, we are required to obtain an understanding of internal control over financial reporting but not for the purpose of expressing an opinion on the effectiveness of the Trust’s internal control over financial reporting. Accordingly, we express no such opinion. We have served as the Trust’s auditor since 2016. (1) Calculated as investment in gold at fair value divided by net assets. * - Based on weighted average number of Receipts issued and outstanding over the period. The Vaulted Gold Bullion Trust (the “Trust”) was initially formed on December 10, 2013. The Trust is governed by the second amended and restated Depositary Trust Agreement, dated May 11, 2017 (the “Depositary Trust Agreement”). Commencement of operations occurred on August 5, 2016. The Bank of New York Mellon is the trustee (the “Trustee”) and BNY Mellon Trust of Delaware is the Delaware trustee (the “Delaware Trustee”). The Bank of Montreal (the “Initial Depositor”) sells Gold Bullion (“Gold”) to the Trust, arranges custodial services through its storage account and provides administrative services from time to time. The Vaulted Gold Bullion Trust is not a registered investment company under the 1940 Act. The Trust is intended to hold Gold for the benefit of owners of Gold Deposit Receipts (“Receipts”). One Receipt represents the undivided beneficial ownership of one troy ounce of Gold. Investors (through registered broker-dealers, or banks or trust companies that become party to the distribution agreement (“Authorized Participants”)) are able to acquire, hold, transfer and surrender only whole Receipts (i.e. no fractional interests), with a minimum of one Receipt per transaction. The Trustee will perform only administrative and ministerial acts. The property of the Trust will consist of the Gold and all monies or other property, if any, received by the Trustee. The fiscal year end for the Trust is October 31. The preparation of financial statements in accordance with accounting principles generally accepted in the United States of America (“GAAP”) requires those responsible for preparing financial statements to make estimates and assumptions that affect the reported amounts and disclosures. Actual results could differ from those estimates. The following is a summary of significant accounting policies followed by the Trust. The Trust is an investment company for financial reporting purpose in accordance with GAAP and is not registered as an investment company under the Investment Company Act of 1940 nor is it required to register under such act. The Gold is held for the benefit of holders of the Receipts in a custodial account operated by Bank of Montreal at the Royal Canadian Mint (the “Mint”) and is valued, for financial statement purposes, at fair value. Fair value is determined by the LBMA (PM) Gold Price, which is set using the afternoon session of the ICE Benchmark Association (“IBA”) equilibrium auction. The Trust follows GAAP guidance for determining fair value and GAAP requires disclosure regarding the inputs to valuation techniques used to measure fair value. Fair value is defined as the price that would be received to sell an asset or paid to transfer a liability in an orderly transaction between market participants at the measurement date. The Trust records its investment in gold at fair value and recognizes changes in fair value of the investment in gold as changes in unrealized gains or losses on investment in gold through the Statement of Operations. Realized gains and losses on the redemption of Receipts, are calculated as the difference between the fair value and cost of gold redeemed. Realized gains and losses are recorded using the specified identification method for cost relief. – Level 1. Unadjusted quoted prices in active markets for identical assets or liabilities that the company has the ability to access. – Level 2. Observable inputs other than quoted prices in an active market that are observable for the asset or liability either directly or indirectly. These inputs may include quoted prices for the identical instrument on an inactive market, prices for similar instruments and similar data. – Level 3. Unobservable inputs for the asset or liability to the extent that relevant observable inputs are not available, representing the company’s own assumptions about the assumptions that a market participant would use in valuing the asset or liability, and that would be based on the best information available. The Trust classifies its investment in gold as Level 1 of the fair value hierarchy. There were no re-allocations or transfers between levels during the period. The Trust issues Receipts on a continuous basis pursuant to the Depositary Trust Agreement. Authorized capital is unlimited. There are 153,304 Receipts issued and outstanding on October 31, 2018 (29,656 Receipts issued and outstanding on October 31, 2017). Holders of Receipts will receive no distributions. The Trust is classified as a “grantor trust” for U.S. federal income tax purposes. As a result, the Trust itself is not subject to U.S. federal income tax. The Trustee has evaluated whether or not there are uncertain tax positions that require financial statement recognition and has determined that no reserves for uncertain tax positions are required as of October 31, 2018 and October 31, 2017. The expenses of the Trust are borne by the Initial Depositor. • fees and expenses of the Trustee and any indemnification of the Trustee. Additionally, the Trustee’s and Mint’s fees are paid by the Initial Depositor and are not separate expenses of the Trust. On May 11, 2017, the Trust entered into: (1) the Depositary Trust Agreement with The Bank of New York Mellon, BNY Trust of Delaware, Bank of Montreal and BMO Capital Markets Corp.; and (2) the Amended and Restated Distribution Agreement with Bank of Montreal and BMO Capital Markets Corp (the “Distribution Agreement”). Bank of Montreal acts as the Initial Depositor of the Trust and holds gold that it transfers to the Trust from time to time in connection with the sale by the Trust of Receipts. Pursuant to the Depositary Trust Agreement and the Distribution Agreement, the offering price for each Receipt consists of the spot price at the time of sale to an investor for one troy ounce of gold, plus: (1) in the case of a Class A Gold Deposit Receipt, a deposit fee of 2.00%, payable to Bank of Montreal, plus a sales fee of 2.00% to any participating broker-dealer that sells Gold Deposit Receipts to an investor; (2) in the case of a Class F Gold Deposit Receipt, which is sold only through fee-based programs, a deposit fee of 2.00%, payable to Bank of Montreal, plus a sales fee of 0.25%; (3) in the case of a Class F-1 Gold Deposit Receipt, which is sold to trust or fiduciary accounts, a deposit fee of 2.00%, payable to Bank of Montreal, and no sales fee; (4) in the case of a Class F-2 Gold Deposit Receipt, which is sold solely to an Institutional Account, a deposit fee of 1.50%, payable to Bank of Montreal, and no sales fee; (5) in the case of a Class F-3 Gold Deposit Receipt, which is sold solely to an Institutional Account, a deposit fee of 1.00%, payable to Bank of Montreal, and no sales fee; and (6) in the case of a Class S Gold Deposit Receipt, which is sold solely to an Institutional Account, neither a deposit fee nor a sales fee. The deposit fee and the sales fee are not expenses of the Trust and have no impact on the financial highlight. The Trust uses the proceeds of the issuance of Receipts, net of these fees, to purchase gold from Bank of Montreal in an amount that corresponds to the amount of Receipts. Bank of Montreal charges holders of Receipts a withdrawal and delivery fee if physical delivery of the gold is requested (the “Withdrawal and Delivery Fee”). Bank of Montreal additionally reserves the right to charge the holders of Receipts a custody fee, not to exceed 0.50% per annum of the daily average closing price of gold represented by the Receipts, as calculated by the Initial Depositor, acting in good faith (the “Custody Fee”). Bank of Montreal did not charge any Custody Fee during years ended 2018, 2017, and the period from August 5, 2016 (commencement of operations) to October 31, 2016. None of the Deposit Fee, Withdrawal and Delivery Fee or Custody Fee is paid by the Trust to Bank of Montreal. Pursuant to the terms of the Distribution Agreement, BMO Capital Markets Corp., one of Bank of Montreal’s affiliates, acts as the Underwriter of the continuous offerings of Receipts and as the calculation agent responsible for calculating the spot price at which Receipts are offered to the public. BMO Financial Group (“BMO”) held 153,118 Receipts as at October 31, 2018. The Net Asset Value per Receipt of those holdings is 1,214.95 for a total market value of $186,030,714 (Cost: $203,243,629). BMO held 29,480 Receipts as at October 31, 2017 with a total market value of $37,444,022 (Cost: $35,853,847). In August 2018, the FASB issued Accounting Standards Update 2018-13, Fair Value Measurement (Topic 820): Disclosure Framework --Changes to the Disclosure Requirements for Fair Value Measurement (“ASU 2018-13”). The update provides guidance that eliminates, adds and modifies certain disclosure requirements for fair value measurements. ASU 2018-13 will be effective for annual periods beginning after December 15, 2019. Management is currently assessing the potential impact of these changes to future financial statements. The Trust’s sole business activity is the investment in gold, and substantially all the Trust’s assets are holdings of gold which creates a concentration of risk associated with fluctuations in the price of gold. Several factors could affect the price of gold, including: (i) global gold supply and demand, which is influenced by factors such as forward selling by gold producers, purchases made by gold producers to unwind gold hedge positions, central bank purchases and sales, and production and cost levels in major gold-producing countries; (ii) investors’ expectations with respect to the rate of inflation; (iii) currency exchange rates; (iv) interest rates; (v) investment and trading activities of hedge funds and commodity funds; and (vi) global or regional political, economic or financial events and situations. In addition, there is no assurance that gold will maintain its long-term value in terms of purchasing power in the future. In the event that the price of gold declines, the value of an investment in the Receipts will decline proportionately. Subject to certain restrictions stated in the Trust’s prospectus, Receipts may be redeemed after notice at the option of the holder. There is concentration risk which could trigger a termination event when Receipts are not widely held. As at October 31, 2018, BMO held 153,118 of the Receipts issued and outstanding (29,480 as at October 31, 2017). Each of these events could have a material effect on the Trust’s financial position and results of operations. Under the Trust’s organizational documents, the Trustee (and its directors, employees and agents) and the Initial Depositor (and its members, managers, directors, officers, employees and affiliates) are indemnified by the Trust against any liability, cost or expense it incurs without gross negligence, bad faith or willful misconduct on its part and without reckless disregard on its part of its obligations and duties under the Trust’s organizational documents. The Trust’s maximum exposure under these arrangements is unknown as this would involve future claims that may be made against the Trust that have not yet occurred. The Trust is presenting the following financial highlights related to investment performance and operations of the Receipts outstanding for the year ended October 31, 2018, the year ended October 31, 2017, and the period from August 5, 2016 (commencement of operations) through October 31, 2016. The Trust evaluated subsequent events from October 31, 2018 through January 28, 2019, the date the financial statements were issued. The Trust concluded that no subsequent events have occurred that would require recognition or disclosure in the financial statements. The Trust maintains disclosure controls and procedures that are designed to ensure that information required to be disclosed in its reports under the Exchange Act is recorded, processed, summarized and reported within the time periods specified in the rules and forms of the SEC, and that such information is accumulated and communicated to an executive or senior officer of the Initial Depositor familiar with and responsible for supervising the Trust and its operations, as appropriate, to allow timely decisions regarding required disclosure. Under the supervision and with the participation of an executive or senior officer of the Initial Depositor, the Initial Depositor conducted an evaluation of the Trust’s disclosure controls and procedures, as defined under Exchange Act Rules 13a-15(e) and 15d-15(e). Based on this evaluation, the designated officer of the Initial Depositor concluded that, as of October 31, 2018, the Trust’s disclosure controls and procedures were effective. The management of the Initial Depositor is responsible for establishing and maintaining adequate internal control over financial reporting of the Trust. Internal control over financial reporting is defined in Exchange Act Rules 13a-15(f) and 15d-15(f) and is a process designed by, or under the supervision of, an executive or senior officer of the Initial Depositor, and effected by the management of the Initial Depositor and other personnel to provide reasonable assurance regarding the reliability of financial reporting and the preparation of financial statements for external purposes in accordance with GAAP. The Trust’s internal control over financial reporting includes those policies and procedures that (i) pertain to the maintenance of records that, in reasonable detail, accurately and fairly reflect the transactions and dispositions of assets; (ii) provide reasonable assurance that transactions are recorded as necessary to permit preparation of financial statements in accordance with GAAP, and that receipts and expenditures are being made only in accordance with the authorizations of the Initial Depositor’s management; and (iii) provide reasonable assurance regarding prevention or timely detection of unauthorized acquisition, use, or disposition of assets that could have a material effect on the financial statements. Because of its inherent limitations, internal control over financial reporting may not prevent or detect misstatements. Projections of any evaluation of effectiveness to future periods are subject to the risk that controls may become inadequate because of changes in conditions, or that the degree of compliance with the policies or procedures may deteriorate. The management of the Initial Depositor has assessed the effectiveness of the Trust’s internal control over financial reporting as of October 31, 2018. In making its assessment, the management of the Initial Depositor has utilized the criteria set forth by the Committee of Sponsoring Organizations of the Treadway Commission in Internal Control – Integrated Framework (2013 framework). Management concluded that based on its assessment, the Trust’s internal control over financial reporting was effective as of October 31, 2018. This annual report does not include an attestation report of the Trust’s registered public accounting firm regarding internal control over financial reporting. Management’s report was not subject to attestation by the Trust’s registered public accounting firm pursuant to the rules of the SEC that permit emerging growth companies to provide only the management report on internal control over financial reporting included in this annual report. There have been no changes in the Trust’s or Initial Depositor’s internal control over financial reporting that occurred during the Trust’s fiscal year ended October 31, 2018 that have materially affected, or are reasonably likely to materially affect, the Trust’s or Initial Depositor’s internal control over financial reporting. On May 11, 2017, the Trust entered into the Second Amended and Restated Depositary Trust Agreement with The Bank of New York Mellon, BNY Trust of Delaware, Bank of Montreal and BMO Capital Markets Corp. On July 11, 2018, the Trust entered into the Second Amended and Restated Distribution Agreement with Bank of Montreal and BMO Capital Markets Corp. Audit Fees. For the year ended October 31, 2018, Bank of Montreal, as Initial Depositor, was billed $90,000 for professional services rendered for the audit and review of the Trust’s financial statements by KPMG LLP. All Other Fees. There were no other fees billed for products or services provided by KPMG LLP, other than those reported in this Item 14. See Item 8 included in this Annual Report on Form 10-K.
All other schedules are omitted because they are not required, or are not applicable, or the information is included in the financial statements. A list of exhibits required to be filed as part of this Annual Report on Form 10-K is set forth in the Exhibit Index, which immediately precedes such exhibits and is incorporated herein by reference. 31.1 Certifications pursuant to Section 302 of the Sarbanes-Oxley Act of 2002. Pursuant to the requirements of the Securities Exchange Act of 1934, the registrant has duly caused this annual report to be signed on its behalf by the undersigned in the capacities thereunto duly authorized. * The Registrant is a trust and the persons are signing in their capacities as officers of Bank of Montreal, the Initial Depositor of the Registrant.